Workshop on Micro-Optical MEMS entitled “Next-Generation MEMS/MOEMS Technologies and Devices” took place at Politecnico di Torino at Jan. 12th 2018. 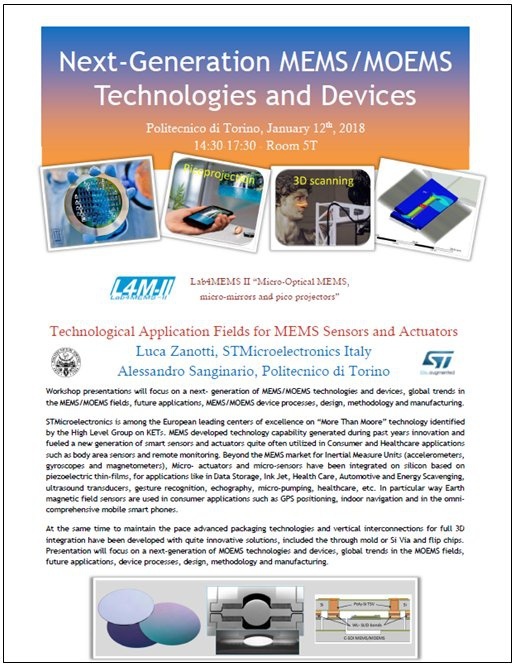 The workshop entitled “Next-Generation MEMS/MOEMS Technologies and Devices” was organized at Politecnico di Torino on January 12th, 2018. During the Workshop the presentation entitled “Technological Application Fields for MEMS Sensors and Actuators” by Luca Zanotti, STMicroelectronics Italy and Alessandro Sanginario, Politecnico di Torino was presented and discussed with the audience. Workshop had 55 participants that were Master and PhD students, and some Professors or PostDocs.